The inn and the décor are very charming. The gas fireplace and jacuzzi bathtub were great to have. Nice having a balcony with table and chairs to look out in the huge yard where hens were roaming. 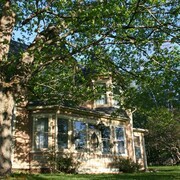 The inn has a peaceful, relaxing country feel to it. I had to check out early, before breakfast, but the dining area also looked very country-charming. I cant say enough good things about this hotel. Location is amazing, close to everything and loved the underground parking. The bathroom was so luxurious and spacious, loved the walk in shower. The free breakfast was fantastic, something for everyone, lots of choices. The pool was warm and clean, the whole hotel was spotless! Staff were very friendly. We will definitely be returning, cant wait to stay again! Where to find Sackville hotels near an airport? 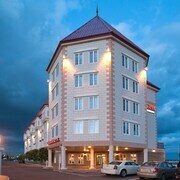 Where can I find hotels in Sackville that are near tourist attractions? For tourists planning a trip to Moncton and are after a comfortable hotel or apartment in Sackville, there are several alternatives. The center of Sackville has 2 Expedia-recommended accommodation options within 0.1 kilometres (0.06 miles). The Marshlands Inn is a sought-after accommodation choice due to the fact that it is located so conveniently to Sackville's town center. 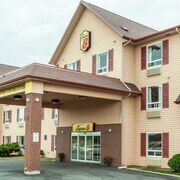 16 kilometres (10 miles) away from the heart of Sackville, is the Comfort Inn Amherst. 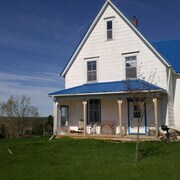 Alternatively, the Wandlyn Inn Amherst is located 14 kilometres (8 miles) away. You could also choose to check out the amenities and rates at the Coastal Inn Sackville or the Super 8 Amherst Nova Scotia. Looking for more to do? Why not spend some time discovering Parlee Beach Provincial Park and South Cove Camping and Golf, in Shediac, 40 kilometres (24 miles) to the north of Sackville. 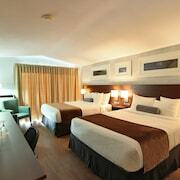 The Seely's Motel and L'Auberge Gabrièle Inn are a few of the great long and short-stay alternatives in Shediac. Or stay in Dieppe, 35 kilometres (23 miles) to the northwest of Sackville, where you can pick from the St. James Gate and Residence Inn by Marriott Moncton. If you stay in Dieppe, don't miss the Champlain Place Mall and Fox Creek Golf Club. Just because you're traveling, doesn't mean you can't enjoy your obsession for sport. Moncton Coliseum can be found 40 kilometres (26 miles) to the northwest of Sackville. 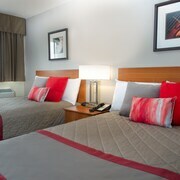 For travelers who are keen on booking a bed nearby, make a reservation in the Hampton Inn & Suites by Hilton Moncton or Four Points by Sheraton Moncton. Situated 35 kilometres (22 miles) away from Sackville is Greater Moncton International Airport. 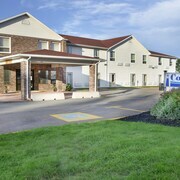 Stay nearby at Holiday Inn Express Hotel & Suites Airport Dieppe or Fairfield Inn & Suites Moncton. What are the most popular Sackville hotels? Are there hotels in other cities near Sackville? 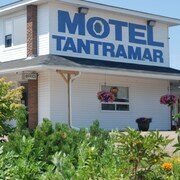 What other types of accommodations are available in Sackville? Explore Sackville with Expedia.ca’s Travel Guides to find the best flights, cars, holiday packages and more!